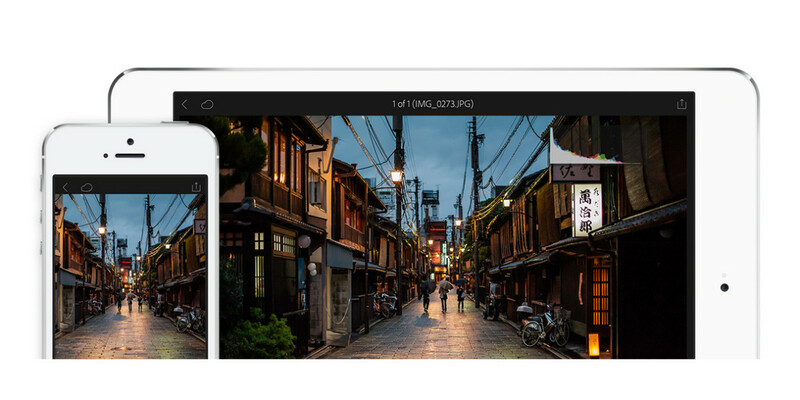 Adobe’s Lightroom Mobile app for iPad and iPhone has generally been known as a companion app for the company’s desktop photo management tool. While it was always available free for download, it required the desktop app — and a subscription to Creative Cloud — to achieve a meaningful workflow. Lightroom for mobile on iOS can now be used locally on your phone or tablet without the desktop Lightroom app, without a Creative Cloud Photography Plan subscription and even without an Adobe ID. The same feature is coming soon to Android. This move is part of an overall desire to broaden the audience. By letting people use Lightroom for mobile without Creative Cloud, Adobe is making the app competitive with other popular standalone photo editing apps like Snapseed or Pixelmator’s mobile version. “We’re seeing alot of people come in first on Lightroom mobile, so now we’re allowing people to use it locally on their local assets, their local photos and videos on their phone and tablet for as long as they like,” Tom Hogarty, Adobe’s director of product management for digital imaging told TNW. As the number of exclusive smartphone shooters with no connection to the desktop rises, Adobe considers this a good time to transition the target audience of the app. “More and more people are adopting the phone as their primary camera, taking the DSLR out less and less, and we’re seeing the same thing with the use of Lightroom. Some users are creative pros who are aiming for efficiency, but many others are just consumers who love photography,” Hogarty said. The difference now is that mobile users can now choose to participate in the trial of Creative Cloud Photography Plan — or not — whereas in the past, just using the mobile version automatically activated the trial. That gave people a limited time to engage with it. “Now, anyone can adopt Lightroom Mobile as their go-to, day-to-day photo app or on their phone,” Hogarty said. This new version adds a number of features, including a camera function that lets you shoot directly from the app. The famous new Dehaze filter, now in the desktop app, is also present in mobile. A new Target Adjustment Tool in the Color/B&W tool lets you adjust hue, saturation and brightness directly throughout the image. With concurrent updates to Adobe’s Premiere Clip — now also in version 2.0 — you can use a collection of still photos to build video presentations synced to music. The brand new Photoshop Fix is integrated with Lightroom for mobile via CreativeSync and you can access it through a new Edit In option. The Android version also got updated to version 1.3. Now, you can use the new Color/B&W adjustment tool to refine individual colors, employ the new Tone Curve adjustment tool to control photo tone, take advantage of adjustable vignettes, and use crop tool alongside adjust, align and auto-straighten tools. The Android version also now supports the TIFF format. A new Lightroom Photos collection feature for both mobile platforms displays your Camera Roll photos and videos by date. An update to Lightroom’s Web app lets you edit in the browser. In the past, Lightroom on the Web was merely a conduit for accessing photos stored on the cloud. Today, Hogarty says that Lightroom is being fashioned as the Creative Cloud ground zero for photography, supporting photographic formats exclusively. Note that if you want to share between the tablet and the Web, you will need a Creative Cloud login, and to continue, you have to subscribe. In addition to the profound changes in the mobile versions of Lightroom, Adobe has also updated the desktop version and Camera Raw to version 9.2.